Hit CRTL + D to bookmark this page! Min. order for this special offer are 4 m2. All prices in Euro ex works, VAT excl. This year over 190 m2 of pontoons have allready delivered to Egypt. This year over 500 m2 of pontoons have allready delivered to Lithuania. To visit the installations, please contact directly our general distributors, they will be pleased to show you all and make you an offer. DIBS (Dubai International Boat Show) from 11.-15. March 2008 in Dubai International Marine Club, Stand 68. Now we will include to every order/delivery a nice fish sticker for free (see below)! This oxygen concentrator was developed to enrich water with highly concentrated oxygen. With dimensions of (LxWxH) 50 x 23 x 36 cm und a weight of approx. 16 kg, it is small enough to be placed nearly everywhere. The oxygen is removed and concentrated from ambient air by three molecular screens. The oxygen concentration at 20 °C and 50 % air humidity is approx. 86-90 % resp. 90-98 % at a flow of 1-3 resp. 3-5 l/min. A strong compressor guarantees for the pre-set outlet pressure of approx. 1 bar. The electricc connection is 220-240 V/50 Hz and power consumption approx. 360 Watt (2 Ampere). The oxygen tank is recommended for the storage of oxygen, which allows a regulated economic oxygen supply for different pools or ponds. With dimensions of (LxWxH) 85 x 28 x 50 cm and a weight of approx. 16 kg, it is a compact central sturage tank with 40 liter volume (max. 8 bar). Fitted with an adjustable pressure regulator (0.1-4.2 bar) to which the oxygen concentrator is connected, it works only when realy necessary and so it saves energy too. This oxygen reactor allows an economic satturation of water with oxygen without pressure drop. With dimensions of (LxWxH) 48 x 32 x 80 cm and an empty weight of approx. 9 kg, it is suitable for a water flow of up to 18 m3/h. Against the slowly moving oxygen bubbles, the water in the reactor flows from top to bottom and is mixed, therefore a high oxygen enrichment is possible because of the long contact time. Oxygen which goes not directly into solution builds a large bubble in the upper part of the reactor, but is additionally used trough the special flow of the water. The filling of the reactor with oxygen is doen from an oxygen generator or oxygen cardridge. The connections are 1 1/2" for water and 4/6 mm for the oxygen pressure hose. The oxygen diffuser creates with minimal pressure extremely fine gas bubbles. With a diameter of 155 mm, a height of 180 mm and a weight of approx. 2.5 kg, it is self sinking and also build into the oxygen reactor. The flow is up to 1 l/min and the operation pressure 0.2-0.3 bar (at a water deepth of 1 m). This optical principle of measurement guarantees for long-time stable measured values, which increase the process stability dramatically and allows to save energy. The probe needs no flow, no calibration as well as no complicated change of membrane and electrolyte. The low maintenance requirements allow a very economic operation. The measurement of the interval makes this method resitant against all failures. The long tested practice showed, that negative effects of other traditional electrochemic methodes are removed completely. The new probe in stainless steel with luminiscence method and automatic temperature compensation has a measurement range of 0.05-20.00 mg/l (1-200 % satturation) and 0.1-50.0 °C. The accuracy is 0.05 mg/l and the respond time <30-90 s (at 20 °C). Analysis of Solids in Natural Waters by Thomas R. Crompton. Hardcover (1996). The presence of toxic organic and inorganic substances in rivers and oceanic sediments is in part due to man-made pollution. Their monitoring by chemical analysis of oceanic, estuarine, and river sediments or of organisms living in the respective ecosystems are of utmost importance. The purpose of this book is to provide the chemist with all available information for the rapid development and proper carrying out of these methods of analysis. Crompton's book is the first book which covers all kinds of samples including living organisms. Standard Methods for Examination of Water & Wastewater by Arnold E. Greenberg et al. Hardcover (1999). The bible of water analysis and THE book of standards! Comprehensive testing of all major pollutants, giving precise instructions for proceedures, preparation of studies as well as current reference data. Every conceivable method for the chemical, biolgical and physical analysis of fresh, brackish and seawater, biological contaminants and pollutants, are covered in detail. Includes sampling techniques, statistical methods, laboratory apparatus and reeagents, safety setup and calibrations, determination of general water quality parameters, metals, automated analysis, toxicity tests for aquatic organisms, aquatic botany (inclusive plankton sampling), and a special section on the identification of aquatic organisms with color plates. Now in its 20th edition, this text presents significant improvements of methodology and enlarged its scope to include techniques suitable for examination of many types of samples encountered in the assessment and control of water quality and water pollution. Water Quality Control Handbook by E. Roberts Alley. Hardcover (2000). This handbook is intended to provide industrial, governmental, and consulting environmental practitioners a quick reference guide to all major areas of water pollution control. Among the topics discussed are the physical, chemical, and biological characteristics of wastewater; monitoring, sampling, and testing methods; the modeling of the effects of pollutants on the environment; effective management, including the establishment of policies and proper documentation; applicable water pollution regulatory standards; and the theory, design recommendations, and practical suggestions for various water pollution control systems. Pond Aquaculture Water Quality Management by Claude E. Boyd et al. Hardcover (1999). The only hope of supplying the world's ever-increasing demand for aquatic food products is through aquaculture, and the vast majority of this is conducted in ponds. Although pond aquaculture may appear at first to be an archaic method of growing aquatic animals, it is one that is consistently profitable when the pond is managed properly. The most important aspect of pond management is the maintenance of adequate environmental conditions for good growth and health of the animal under culture. Water quality in ponds also extends into the areas of environmental protection and food quality and safety, which are increasingly important in today's world. This book provides the most complete, up-to-date account of water quality and its management in aquaculture ponds. It provides background information on the physical, chemical, and biological environment of pond aquaculture, and illustrates how the proper balance of these factors is the essential ingredient for successful production of fish and other aquatic animals. Management techniques for the control of water quality and productivity include liming, fertilization, mechanical aeration, water exchange, and the use of algicides and herbicides. The authors examine the effects of pollution on aquaculture and the validity of current criticisms by environmentalists. This book will be of great benefit to students, extension agents, policy-makers, government officials and the commercial aquaculture industry. Please note that we have closed from 14. July to 12. August due to vaccation. This device is specially suitable for the save stunning of fishes before killing. It works with electricity over a transformer (Input 230 Volt, Output 42 Volt). All parts of the device are made of corrosion free materials. The handle with buttons and lights is made of plastic, the electrodes are made of brass with honeycomb-like plastic cover. The fishes (up to approx. 50 kg per stunning cycle) are placed in a plastic container together with water. For the stunning, both electrodes are submerged into the water and the button is pressed. For larger fish quantities per stunning cycle we deliver also stunning devices with electrodes build in plastic containers. Automatic scaling machines in various sizes, on request. 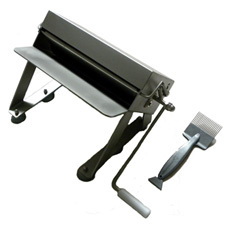 With this compact manual devices made from stainless steel, you can cut fast and easy the Y-bones in fillets from bony rich fishes (like Cyprinids, etc.). With this cutting in small distances (every 3-4 mm), the numberous Y-bones are chopped in very small pieces, so that they are no longer detected or dangerous in the fillets and can be eaten comfortably with the meat. With a special adapter (available as accessoire) you can also cut now the fillets in chips or stripes (and, for example serve it fried or on salad). Electric (12 V DC) Y-bone cutter, on request. Note: Typ F100 and F200 have an integrated storage container for 20 resp. 40 kg ice. Larger liquid-, cube- or block ice machines, on request. By G. M. Hall (Editor), Hardcover, 292 pages (1996). Written as an overview of the field for industrialists wishing to improve and diversify their operation, provides coverage of modern aspects of traditional fish processing technologies, and practical descriptions of important new areas. The first five chapters cover fish biochemistry affecting processing, curing, surimi and fish mince, chilling, freezing, and canning. The final four chapters focus on the increasing globalization of the fish processing industry and the demands, from legislation and the consumer, for better quality and safer products. By Fereidoon Shahidi, Yvonne Jones and David D. Kitts (Editors), Paperback, 266 pages (1997). Research and development of seafood continues to be productive in terms of new and improved products for both food and non-food purposes. The use of biotechnology, microbiology, computer modeling and advanced analytical techniques has led to improvements in processing and product safety. This recent book provides extensive new information on these developments. The 25 reports were prepared by food scientists specializing in seafood. The reports are well illustrated with numerous schematics and some micrographs. Extensive reference data is provided in tables and graphs. By H. Allan Bremmer (Editor), Hardcover, 507 pages (2002). Summarizes important new research on improving quality in fish processing. Covers key processing and preservation technologies ranging from traditional fish drying to high pressure processing. Useful for industry technologists, consultants, researchers, and graduate students, this work surveys issues and solutions in safety and quality in the fish processing industry, with sections on ways of ensuring safe products, aspects of fish quality, and improving quality throughout the supply chain. HACCP systems are covered in depth, and there is material on identifying and controlling hazards from pathogens, toxins, parasites, and heavy metals. Methods for modeling and predicting shelf life are examined, and processing and preservation technologies are covered. By Norman F. Haard and Benjamin K. Simpson (Editors), Hardcover, 681 pages (2000). There are two main reasons to study enzymes from aquatic animals. First is that, though many of the enzymes are also found in terrestrial life forms, they may exhibit vastly different properties with respect to stability, temperature optimum, secondary substrate, and other features because of adaptation to organisms living in various habitat conditions. The other reason is that seafood spoils as quickly when it is microbially sterile as when not, indicating that the spoilage is due to action of native enzymes rather than outside pathogens, and food scientists need to take that into account when attempting to protect seafood quality. Contributors from many of the seafaring nations discuss the different between seafood enzymes and others, a number of specific enzymes, their role in food quality, controlling enzyme activity in seafoods, and industrial applications of the enzymes. Seafood Processing Europe in Brussels/Belgium from 24-26 April 2007, Hall 4, Stand 5114. We have an electronic VIP registration number for you to register free and easily. 1. Visit the event web site: www.euroseafood.com or www.europrocessing.com and click on "visitor registration" and follow the instructions on the screen. 2. On the first screen you will be asked the question: Did you receive a registration form or see an ad with a 4-digit value code? Choose "Yes". 3. A box to enter a code will appear. Enter "9958" for your VIP registration and then click continue. 4. Continue to follow the instructions on the screen until you receive a confirmation. You will also receive an email confirmation. 5. Print this confirmation and bring it with you to the exhibition to receive your badge. Register before March 30, 2007 to receive your badge by post. Print this VIP invitation and present it at one of the VIP registration counters. Important: You must bring yourthis VIP number to the exposition. Registration staff will not have a listing VIP numbers. 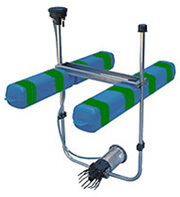 This injectors are one of the best and most advanced aeration systems worldwide, and also suitable for large ponds. 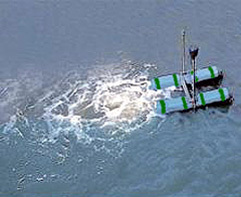 They work with an for endurance run produced, maintenance free, turnable, submerged (also seawater resistant). The rotating propeller (2800 r.p.m.) produces an adjustable current, through which air drawn from the surface and formed into fine evenly distributed bubbles. The diffused air aerate from the bottom up and the circulation created from the fine bubbles displaces the surrounding water, thus breaking up stratified water areas. This constant surge forces the pond to turn over, bringing cooler bottom water to the surface, where it picks up additional oxygen from the atmosphere. Therefore the dissolved oxygen is always as high as possible. Through the eutrophication process (of faeces and feeds) there is usually oxygen deficit at depth, therefore this system works to an adjustable depth and introduces the oxygen where it is needed, not only on the surface. If submerged, pure oxygen instead of air can be introduced with exact dosage. 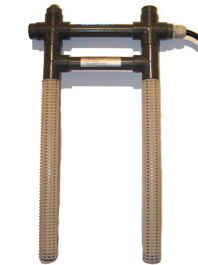 Long contact time of the fine bubbles in the water, ensures also this system is very effective. Depending on installation, depth and current, sediments can also be cleaned. If the aerator is positioned near the water surface it also acts as an ice clearing machine in winter. Strong circulation also eliminates pond stratification and organic matter deposition. Finally thanks to the floatation phenomenon (foaming), this aerators make it possible to remove excess algae proliferation, colloidal substances, mud and any other suspended particles and improve water quality. With this proven system, all variants of aeration, current creation and oxygenation are possible. Depending on power and depth, the air flow rate is up to 35 cubic meter/hour. At an oxygen content of 6 mg O2/l at beginning, one 1.0 HP unit in use with air, introduce over 0.32 kg O2/h which is the oxygen demand for over 2600 kg (table sized 250 g) trouts at a water temperature of 10 °C, or for up to 3000 kg of other species (i.e carps or tilapias) at higher temperatures. 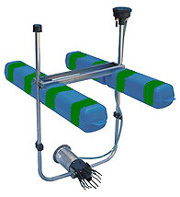 Theese proven aerators are made in China and are supplied complete with motor, supports, float kit and propeller protection fingers, but are not available for delivery to: Portugal, Spain, Italy, France, Belgium, Germany, Danmark, Great Britain, USA, Mexico, Thailand and Taiwan. They are lightweight compact systems (Motor: 14 to 16 kg), and very easy to install. or order as paperback (for EUR 5,-).